Our plastic crusher is the machine to save on costs, break big plastic articles into smaller pieces for faster processing resulting in higher production and great savings on labour and electricity. If you have large plastic articles in various shapes and sizes and you need to turn these scrap materials or components into smaller pieces that can be further granulated for use in your manufacturing processes, or for sale of plastic granules then our plastic crusher machine is just the machine you need. It doesn't matter if it's small PET bottles, PVC, vinyl, plastic containers, long strips, or big table, chairs, pipes, crates, toys etc. a host of other sizes and configurations, getting it down to a manageable or recyclable size is what our plastic crusher does best. The ideal shredder equipment needed for this initial size reduction can be made according to the material for shredding. 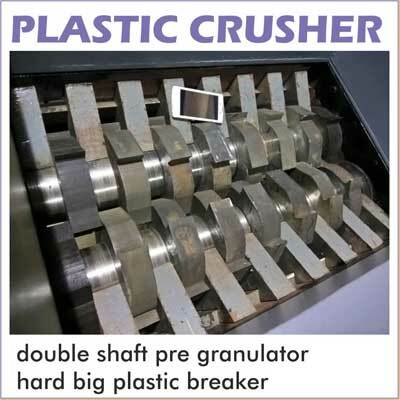 Our plastic crusher offers a wide range of different cutter design with width from 120mm to 350mm with heavy-duty transmission that generates enormous torque to easily and effortlessly break even the most stubborn plastic component. No matter what you need for big plastic breaking or shredding, a SASCO Plastic crusher can help you reclaim or process your plastic products and turn it into a valuable resalable commodity. Not only that with minor customizations these shredders are capable for numerous other applications too.